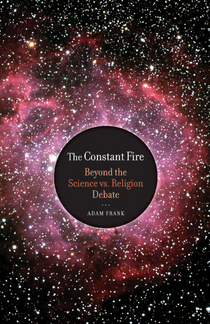 Astrophysics professor and Hubble Fellow Adam Frank has recently published a book that promises to transcend the standard science vs. religion dialogue. Entitled The Constant Fire: Beyond the Science vs. Religion Debate, it seeks a rapprochement between the two camps. I, for one, look forward to reading it. An article about the book may be found here. Here are a few more publication details, including a table of contents, on the University of California Press web site.